Veena is a musical instrument mentioned even in the Vedas. Gods such as Dakshinamurthy (Shiva), Shaarada and sages like Naarada, Tumburu hold a Veena in their hands. Their veenas are called Rudra, Kacchapi, Mahati and Kalaavathi respectively. It is believed by some that Bharateeyas have attributed their own instruments to their deities as well. This view is incorrect. During intense meditation, the Rshis of Bhaarata, had an inner vision of the Gods holding these instruments. They accepted their vision of these instruments as a gracious gift of God to mankind. The physical instrument was designed according to their inner vision and in a manner befitting the tattvas (or principles) which are represented by these instruments. 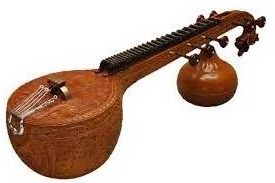 Hence it is said in our ancient literature –“Yaa daiveeveena tadanukruti rasau maanushee veena” (The veena made by man is verily the imitation of the divine veena). Gyanis have professed that the veena is not just a musical instrument but a representative form of Parabrahman. The reason being, the instruments capability, to elevate a devout and deserving listener to the level of Parabrahman. It is not apt to fix a time frame for the instruments decorating the hands of Gods. To do that would be quite comical, similar to fixing a time limit for sun’s brightness. They are ancient, yet eternal and evergreen. Why do we have so many names for a veena? Depending on their shapes and their reach, different veenas influence the daivee kendras (subtle energy points) of the human body differently. For example: Godess Saraswati is mother prakruti (the entire creation). In fact, she is paraa prakruti ( the seed of prakruti or un-manifest creation). In another form she assumes, she has a veena in her lotus like hands. As per Saankhya Shaastra mother nature has 24 attributes. The 24 frets in the veena represent these. A listener, who is able to enjoy her music within himself, can pull all his sense organs, mind and intellect inwards like a tortoise (kacchapa). He is able to sense, experience and enjoy the divine qualities of the inner primordial sound (naada) even when the veena instrument is played externally. This can elevate him to a state beyond the ken of sensory organs. Thus the fruits of listening to the music being played on this veena, belongs to the realm of both sensory (bhogaayata) as well as extra sensory (yogaayata) perceptions. In contrast, the tone of a Rudra veena, can only influence the inward pulling of sensory organs, and maintain the yogasamaadhi or a blissfull state. The fruit here is primarily to attain salvation. The Sushumna,naadi, which exists within the core of our backbone, is the primary source of all the secrets relating to the union with God (yoga). This Sushumna is also known by other names like Brahma naadi, Jnaana naadi, Prushta vamsha etc. It is also called Veenaadanda. The structure and function of the internal Veenaadanda can be seen reflected in the construction of the veena instrument too. The construction of the Veena instrument resembles the human body and the brahma danda that runs from head down to waist. The internal 7 chakras of the human body resemble the 7 strings. Sound emanates from these strings. The Naagapasha in the veena represents the mind in our body that restrains the Kundalini shakti. The instrument too has a Naagapaasha which anchors all the strings. Godess Saraswati resides in the internal Veenadanda and plays the divine veena executing the wish of Parabrahman, in the process of creation-sustenence and dissolution. This principle exists in the veena instrument as well. Gotu vaadyam is another instrument which requires superior skill and expertise to play. This is essentially a veena without the frets. Hence it is also called as Dhanurveena.